1. Khalil Aminov article headlined "Sports cluster" says that a large sports and education facility worth R100bn (around 3.3bn dollars) will be built in Domodedovo, Moscow Region, on the land plot belonging to Vasiliy Anisimov. The costly project is to be financed from the federal budget; pp 1, 10 (829 words). 2. Andrei Kolesnikov article headlined "Vladimir Putin discusses victims, winners and the one who spends funds" reports on the meeting on the aftermath of the deadly flood in Krymsk, Krasnodar Territory, chaired by President Vladimir Putin; pp 1, 3 (1,266 words). 3. Yury Senatorov and Ivan Safronov article headlined "Torpedo thieves" gives details on the probe into corruption case of the company Oboronservis. It turned out that one of its branches had received components to torpedoes from Kazakhstan for overcharged prices and without proper quality; pp 1, 4 (638 words). 4. Yelena Kiseleva article headlined "Not Superjet quality" says that the Aeroflot airline is displeased with the quality of Sukhoi Superjet 100 aircraft. As many as 40 per cent of all incidents caused by failure of aircraft equipment in 2012 happened to Superjet aircraft; pp 1, 7 (834 words). 5. St-Petersburg-based Anna Pushkarskaya article headlined "It is typical of deputy to make mistakes" says that two Constitutional Court judges have expressed their disagreement with the expulsion of A Just Russia MP Gennady Gudkov from the State Duma; p 2 (669 words). 6. Irina Alexandrova et al. report headlined "Uncertainty vote planned for Nikita Belykh" says the One Russia leadership has said that they do not support Kirov Region deputies planning a no-confidence vote in governor Nikita Belykh; p 2 (582 words). 7. Pavel Korobov article headlined "Sacrament of voting" says the Russian Orthodox Church has for the first time adopted a procedure to elect the Patriarch; p 5 (570 words). 8. Sergei Strokan and Yelena Chernenko article headlined "North Korea tests neighbors and USA" says the USA, South Korea and Japan have warned North Korea against carrying out new nuclear tests, which risks turning the country into a new hot spot; p 6 (659 words). 9. Yelena Chernenko and Ivan Safronov article headlined "Foreign Ministry reshuffles diplomats" details the reshuffle in the Russian Foreign Ministry to take place in the near future; p 6 (565 words). 10. Pavel Tarasenko article headlined "Syrian opposition finds someone to talk to" says the Syrian opposition coalition head Ahmed Moaz al-Khatib has expressed readiness to conduct talks with the Syrian vice-president. The official Damascus has not responded to the proposal so far; p 6 (522 words). 1. Igor Naumov article headlined "Krymsk prosecutors left without job" comments on a scandal with payment of compensation to the victims of the devastating flood in Krymsk in southern Russia. Some people claim they were underpaid, so the prosecutors will check the work of the local authorities; pp 1, 4 (842 words). 2. Vladimir Mukhin article headlined "Bandit underground goes out of hideouts" says that militants stepped out their activity in the North Caucasus in January 2013 despite bad weather, the Russian Interior Ministry directorate for the North Caucasus Federal District said; pp 1-2 (558 words). 3. Valeria Khamrayeva article headlined "Everyone to have his board" says the Russian Supreme Court has ruled to set up administrative case boards within the courts of general jurisdiction. Experts doubt the effectiveness of the measure to make the work of courts more transparent; pp 1, 3 (491 words). 4. Ivan Rodin article headlined "State Duma too busy to check deputies' spending" says that the State Duma's deputy ethics commission has not been carrying out its meetings since December 2012; pp 1, 3 (764 words). 5. Tatyana Ivzhenko article headlined "To Moscow for compromise" says the Ukrainian foreign minister will visit Moscow on 19 March to prepare the meeting of the heads of the two countries to discuss the gas payment problem; pp 1, 7 (941 words). 6. Yevgeny Grigoryev article headlined "EU suspected of squandering" says that the high salaries of some EU officials will be discussed at the EU summit opening in Brussels; pp 1, 8 (706 words). 7. 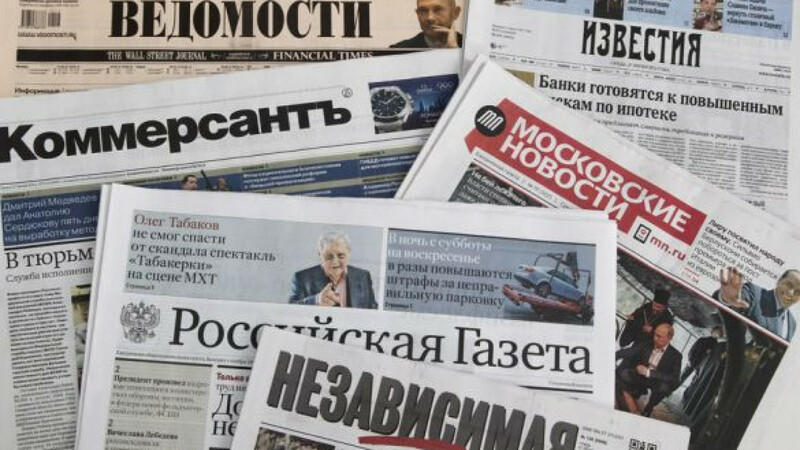 Editorial headlined "Is German journalism leaving Russia?" looks at what has made several German newspapers close their offices in Russia and attributes the decision to the economic crisis in the EU and the new financial policy of the German press; p 2 (535 words). 8. Alexei Gorbachev article headlined "Nikita Belykh's fate to be determined in Kremlin" says that Moscow has expressed dissatisfaction with Kirov Region deputies, who decided to hold a no-confidence vote in governor Nikita Belykh. Moscow made it clear that the country's leadership would decide the fate of the regional head; p 3 (650 words). 9. Sergei Kulikov article headlined "Meat war risks going to space level" says the USA will take asymmetrical measures in response to the Russian ban on U.S. meat imports; p 4 (696 words). 10. Viktoria Panfilova report "Dushanbe suggests that Kremlin pay for someone else's debts" says that Tajikistan has put forward new conditions for the ratification of the agreement on Russia's military base deployed in the country; p 7 (600 words). 11. Vladimir Skosyrev article headlined "Quick peace promised to Afghanistan" says that the heads of Afghanistan and Pakistan have pledged to reach an agreement with the Taliban by mid 2015, when NATO forces leave the country; p 8 (474 words). 12. Yury Paniyev article headlined "Moaz al-Khatib offers hand to Syrian vice-president" says the National Coalition for Syrian Revolutionary and Opposition Forces has confirmed its readiness to start talks with official Damascus; p 8 (635 words). 13. Anatoly Chernyayev report "Bad luck to winners" says that the recent meeting of the Russian Orthodox Church leadership has once and for all buried church democracy; pp 1-2 of the NG Religion supplement (1,600 words). 1. Filipp Sterkin and Olga Plotonova article headlined "Foreign accounts to be attached to Russia" says the Russian authorities will step up control over people's financial transactions. People will be able to transfer money abroad only via Russian banks; pp 1, 4 (631 words). 2. Editorial headlined "All-country needs" comments on Putin's decision to take the public utilities sector under control and notes that the number of people, who believe the president to be responsible for municipal issues, is growing in Russia; pp 1, 6 (455 words). 3. Igor Tsukanov and Yelizaveta Sergina article headlined "VTB fails to keep arrest" says the UK Supreme Court has cancelled the seizure of Konstantin Malofeyev's assets. The bank VTB Capital lost the case against its debtor; pp 1, 16 (808 words). 4. Another editorial headlined "Village money" welcomes the decision of entrepreneurs in a village in Bashkortostan to issue their own analogue of the Russian national currency in an attempt to cope with financial difficulties; p 6 (267 words). 5. Andrey Kolesnikov article headlined "Political economy: Invisible government" says that public opinion polls have shown that most Russian ministers are unfamiliar to people. Moreover, only 18 per cent of respondents take interest in the work of the government; p 6 (425 words). 1. Margarita Kazantseva et al. report headlined "Petrol deficit to grow by 70 times in three years" says the Federal Anti-Monopoly Service has warned that petrol deficit on the Russian market may grow by 70 times by 2015, compared with the current state of the fuel market, due to new regulations for fuel quality; pp 1, 4 (830 words). 2. Alena Sivkova and Vladimir Dergachev article headlined "New agency to ensure ethnic peace" says the Russian presidential council for ethnic relations has come up with an initiative to set up a private agency to promote the Russian national strategy; pp 1, 3 (525 words). 3. Ivan Cheberko article headlined "Americans agree to accept Glonass" says that despite current disagreements in Russian-US relations, Washington has agreed to deploy some of the equipment required for the Glonass navigation system to work on its territory; pp 1, 4 (510 words). 4. Pavel Chernyshov article headlined "Russia loses R500bn due to fly-by-night companies" says the Russian Audit Chamber has checked the work of the Federal Customs Service in 2012 and found out that companies failed to return R492bn (16.4bn dollars) they have paid as part of the agreements that have not been implemented; pp 1, 4 (540 words). 5. Pyotr Kozlov article headlined "Young One Russia members threaten to block websites violating regulations" says the Young Guards (One Russia's youth movement) is launching an online project to find websites with dangerous and illegal content; p 3 (576 words). 6. Vladimir Gusev interview with Kirov Region Communist Sergey Mamayev speaking on a campaign launched in the region against governor Nikita Belykh; p 3 (387 words). 7. Mikhail Vignanskiy interview headlined "It is time that Russia and Georgia deal with visa issue" with Zurab Abashidze, the Georgian prime minister's envoy for relations with Russia, speaking on progress in bilateral relations; p 7 (422 words). 8. Irina Khakamada report "Label without reforms" says that the authorities' political and economic ideology has become outdated in the new historical conditions; p 10 (850 words). 1. Yelena Kukol interview headlined "Big money in small font" with Vasily Pozdyshev, director of the bank regulations department of the Bank of Russia, speaking on Russians' growing debts to banks and threats to the banking system; pp 1, 5 (1,313 words). 2. Vladislav Kulikov article headlined "Shall we argue, boss?" comments on the Russian Supreme Court ruling to set up administrative case boards in courts to help individuals who sue officials; p 1-2 (628 words). 3. Fyodor Lukyanov article headlined "Why do we need Georgia?" looks at prospects for development of Russian-Georgian relations; p 3 (691 words). 4. Vladislav Vorobyev interview with Russian Deputy Foreign Minister Grigory Karasin speaking on Russian-Georgian relations; p 8 (600 words). 5. Kira Latukhina report "Not single terrorist attack" looks at a meeting between Putin and Chechen leader Ramzan Kadyrov; p 2 (700 words). 6. Natalya Kozlova report "Those who are right and guilty" looks at opposition politician Boris Nemtsov's questioning at the Investigations Committee; p 7 (600 words). 7. Susanna Alperina report "Iron ladies live" says that Tina Kandelaki and Margarita Simonyan will host a new talk show on NTV; p 7 (400 words). 8. Yekaterina Zabrodina article headlined "Over boss's head" says that the Syrian opposition has for the first time agreed to talks with the vice-president; p 8 (500 words). 9. Andrei Shitov report "News from outside" says that someone has subscribed Viktor But (Bout), Russian businessman jailed in the USA, to Russian newspapers; p 8 (450 words). 1. Mikhail Rostovsky article headlined "Blackening Belykh" looks at a smear campaign against Kirov Region governor Nikita Belykh and notes that both One Russia and the opposition are using the chance of attacking the regional head; pp 1-2 (664 words). 2. Olga Boguslavskaya article headlined "Astakhov carried away" criticizes Russian children ombudsman Pavel Astakhov over his stance on US adoptions; pp 1, 5 (952 words). 3. Mikhail Zubov article headlined "Nikita Belykh's early resignation would be logical" features comments of two political analysts on Kirov Region governor Nikita Belykh's possible resignation; p 2 (650 words). 4. Yury Butnev report "Europol will save football" says that a new war on football match fixing has been declared in Europe; p 8 (300 words). 1. Alexander Litoy article headlined "Mapping routes of police vans" comments on the OVD-Info rights protection project analysis of protests, which says that the main power of protests is its participants, not organizers; p 2 (400 words). 2.Yulia Yakovleva article headlined "Seven circles of trial" says that the Russian Supreme Court will not consider the appeal against falsifications during the State Duma election in 2011; p 2 (300 words). 3. Inga Vorobyeva article headlined "He forgave debts" says that Russian President Vladimir Putin has ordered not to take away extra money that was paid by mistake from Krymsk residents who suffered from flood in summer 2012; p 3 (250 words). 1. Yulia Savina article headlined "Chamber of obedience" says that pundits doubt whether a new composition of the Federation Council after the change in the scheme of gubernatorial elections in Russia will make the body more independent. Only direct election to the Federation Council can boost its efficiency and make it independent, pundits say; pp 1-2 (1,100 words). 2. Vera Moslakova article headlined "Sovereign liberalism" says that a new Liberal Platform has emerged within the One Russia party, aiming to protect liberal values such as freedom, private property, sovereignty and solidarity; p 2 (700 words). 3. Nadezhda Krasilova article headlined "May vertical help him" says that Kirov Region deputies are planning to consider a no-confidence motion against governor Nikita Belykh, although pundits do not believe they will succeed; p 2 (600 words). 4. Sergei Putilov article headlined "Counted and were surprised" says that the budget deficit of Russia in 2012 turned out to be two times larger than expected; p 3 (600 words). 1. Andrei Kolesnikov article headlined "Stalingrad battle in heads" criticizes the authorities' discussion of the possibility of renaming Volgograd back into Stalingrad and notes that the attempts are made to "nationalize" the victory in the World War II to the benefit of a group of people; p 7 (645 words). 2. Yulia Latynina article headlined "Putin instead of market" notes the role of President Putin in all deals reached by Russian big businesses; pp 2-3 (1,673 words). 1. Alexander Gamov interview with the head of the Russian Audit Chamber, Sergei Stepashin, who says Russia lost R2bn in 2012; pp 10-11 (2,000 words). 1. Alexander Pinchuk article headlined "VTA: Plans of modernization" outlines the key objectives for the modernization of the Russian Military Transport Aviation (VTA); p 1 (600 words).